This necklace was inspired by one my friend Rebecca made. She’s a big bakelite fan and didn’t want to pay a bunch of a bakelite cherry necklace, so she took matters into her own hands and made her own version using red bakelite beads. So when I was at Michael’s craft store and noticed glass leaf beads, I thought I’d have to make my own version of a cherry necklace, and with Rebecca’s blessing I wanted to post this DIY in case you wanted to make your own. 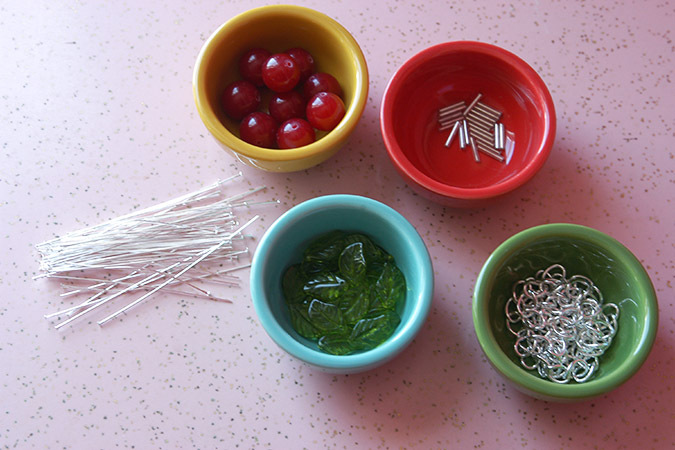 -a necklace (you could make your own with findings and a chain, I just bought a pre-made one at Michael’s, and I find a shorter necklace works best for the cherries. -head pins (I went with the longest size they had 3inches to make sure I had enough length. These look almost like a pin for sewing work with one flat end. -some sort of jewelry tools for bending the ends of the head pins & opening closing jump rings. I had these on hand from previous crafternoons. 1. 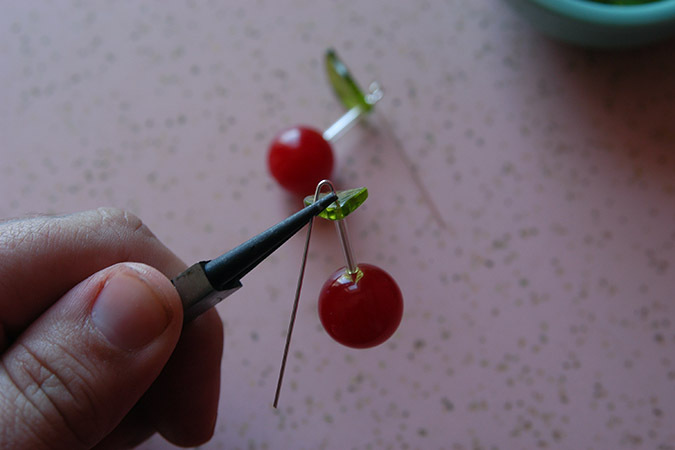 First your going to assemble all your cherries as follows….Onto the head pin with the flat part at the bottom to keep your cherry on the pin. A Cherry bead, a stem bead, a leaf bead. 2. Use your jewelry tool to bend the top of the head pin downward like the photo above, and then just twist it around itself to form a little circle from the head pin, then cut off the extra metal as close to the twist as possible. 3. Once all your cherries are made you can add them individually to your necklace with jump rings, or add two together to each jump ring. 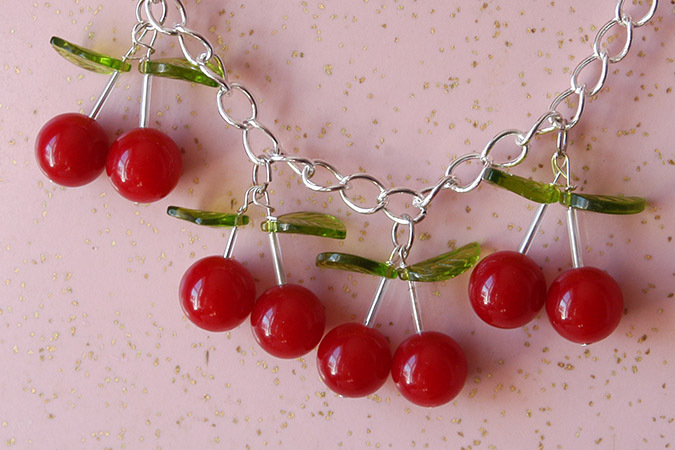 You could even make a bunch of necklaces for gifts that each just have one set of cherries. Tagged DIY. Bookmark the permalink. So cute! I love cherry necklaces like that! Kerri, oh I bet you could do it! 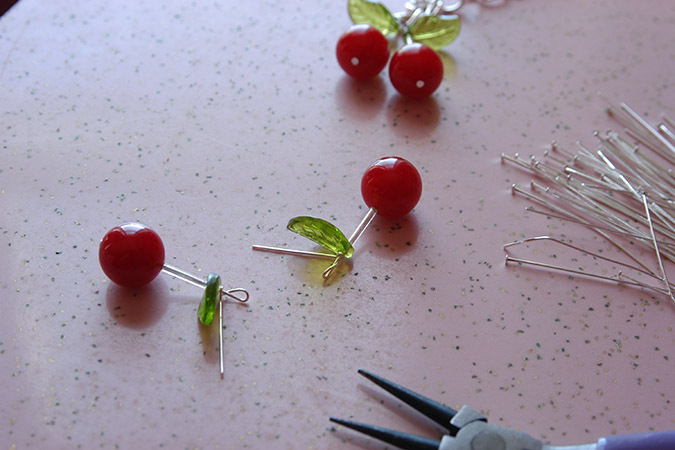 Its really easy, the key to cute cherries is just the beads! Melanie, me too! I used to have a very sweet cherry necklace with just two cherries on it, but it broke once when I was wearing it, and I didn’t notice till it was too late. How wonderful are these. 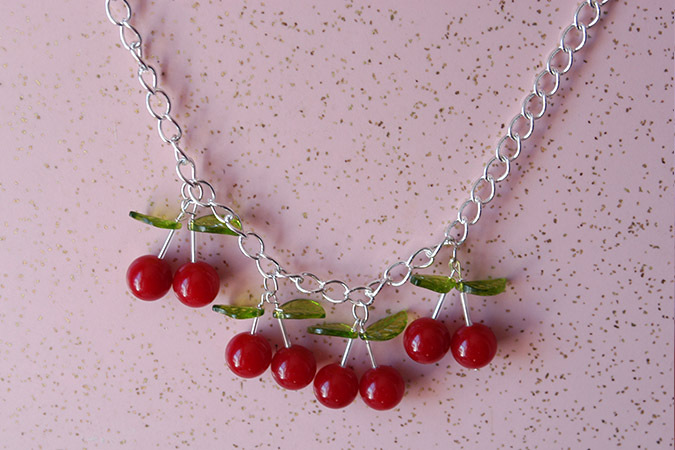 I love cherries and this is the cutest necklace I’ve seen. I want to make this! Thanks for sharing. Rachel, Im so glad you like them! Cant wait to see yours! Simply adorable! Thanks for sharing!